I picked up my Howell TBI kit from a Collins Brother eBay auction. I paid only $1,145 for the kit + $19 to have it shipped to me. The air intake system was also purchased on eBay from a company called Redline Motorsport. The total cost for this was only $59.12 shipped to my door. This air intake system was designed for use on an 1988-95 Chevy Tahoe TBI and so the fit was very good. If you have an aluminum valve cover like I do, you will need to purchase a spacer and a couple of good gaskets to make this work out. The make and part numbers are listed above. I was able to find the Specter air intake spacer kit over at my local Kragen Autoparts store. The Victor Rinze gaskets can be purchased at Napa Auto Parts. Don't forget you will need 2 of them. I reused the old "Check Carb" light that came standard on California CJ's but you can find a small indicator light at Radioshack. 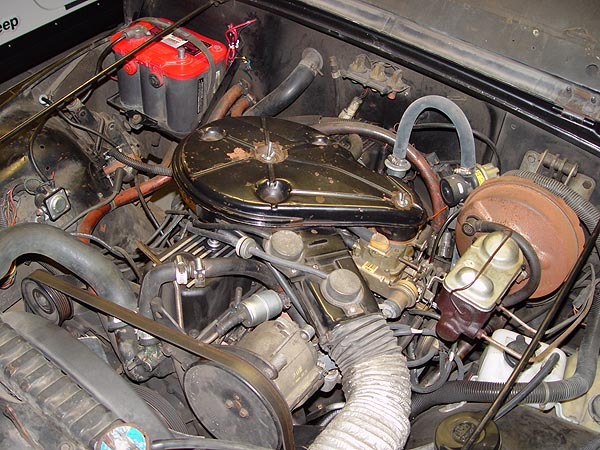 The Howell TBI is a fuel injection conversion kit based on a TBI system found on GM 4.3 liter V-6 engines. This kit is one of only two made for Jeeps that can be ordered California smog legal. The other kit is the Mopar MPI but it typically costs twice the amount. Both the Howell TBI and the Mopar MPI solve the problems typically associated with the infamous Carter BBD (i.e. poor idle/stalling and problematic vacuum lines). Both systems offer a huge improvement over the Carter BBD setup. 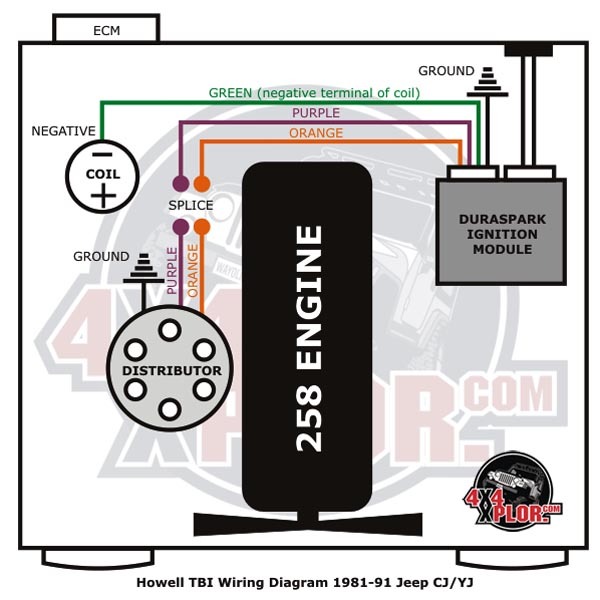 From day one, I have just been dreaming about a day when I could install a Howell fuel injection system on my CJ. One of the biggest reason for wanting fuel injection was so that I could pass a visual smog inspection but one of the biggest benefits of having a fuel injection system is that I could ditch my piece of crap Carter BBD carburetor! No more crappy idle, no more stalling at the most inopportune moments and no more miles and miles of vacuum lines under the hood. 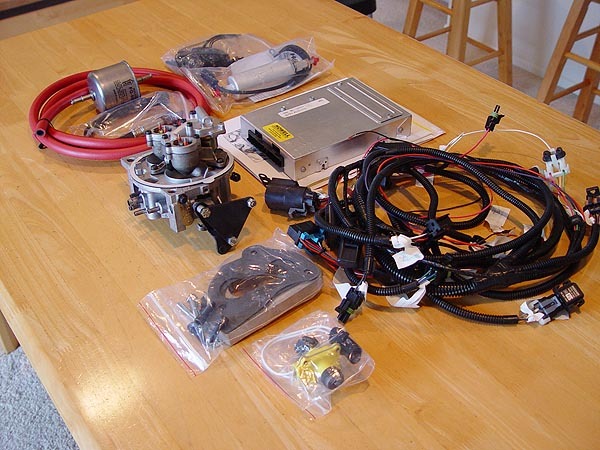 Just so you know, there are other fuel injection kits available out there (like the Mopar MPI) but cost was a factor for me. Also, in the state of California, the Howell TBI and Mopar MPI are the only smog legal fuel injection kits you can use. The instructions that come with the Howell TBI kit is more intended for a 1990 YJ and may seem a bit confusing at times. 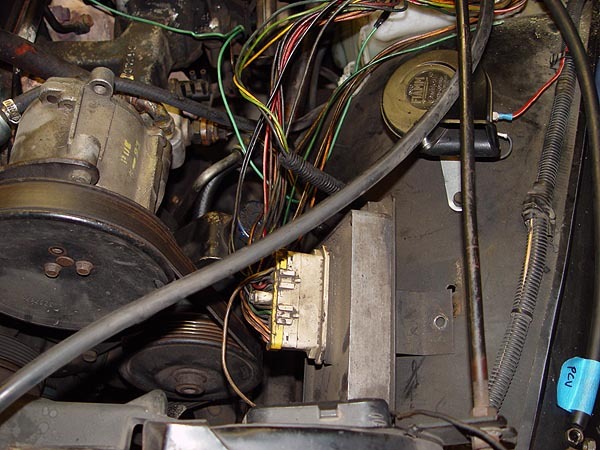 This write-up was written for a 1981 Jeep CJ with a 258 engine so there will be differences along the way. This is a photo of all the things you will get with your new Howell TBI kit. Make sure you have everything, check for any damaged items, sort everything out and then read the instructions that came with the kit. Depending on what year Jeep you have, the actual installation of this kit may vary. Here is a shot of my engine just before I started to yank all the miles and miles of vacuum lines and related emissions crap out. Good by Carter BBD!! 1. Begin this project by disconnecting the negative battery lead. 2. 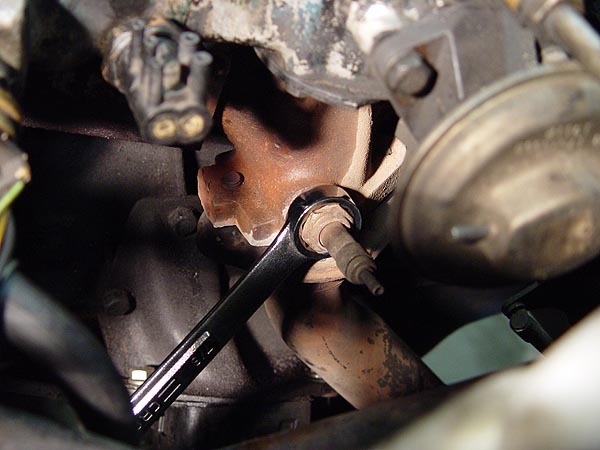 Now, look down and remove the 2 bolts attaching the mechanical fuel pump on the passenger side of your engine using a 1/2" wrench. 3. 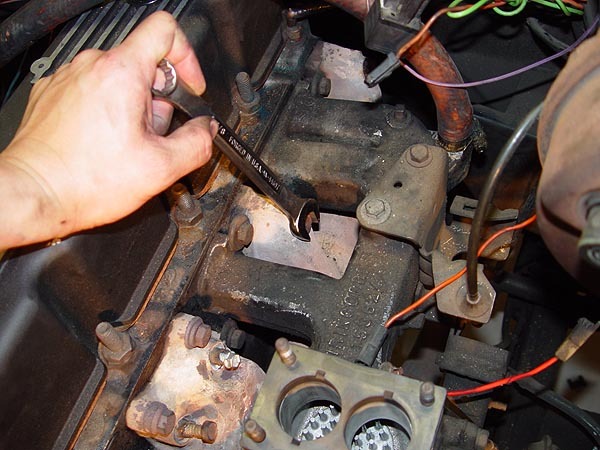 Clean off any gasket material left behind with a gasket scraper or razor and then seal the hole using the block off plate and new gasket provided with the Howell TBI kit. Reuse the old fuel pump bolts to secure the block off plate. 4. 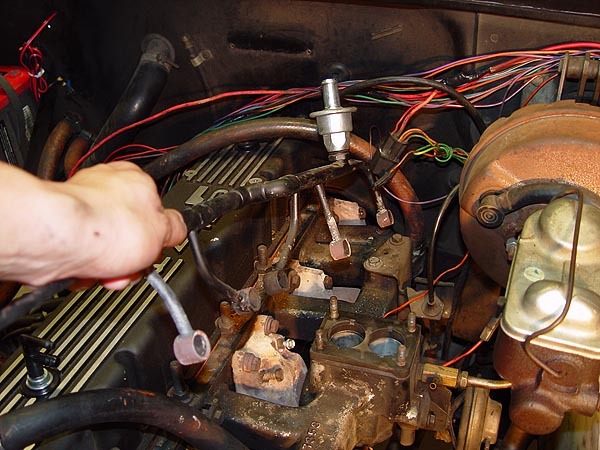 Now, remove the air cleaner (Thermostatic Air Cleaner System or THERMAC for short) from your engine followed by all the other vacuum lines and electrical connectors attached to your old Carter BBD Carburetor. When all is said and done, you will only need 2 connections that will need to be reconnected, the PCV/Canister and Thermal vacuum switch and distributor advance vacuum line. I decided to pull everything so that I could replace the few required with new lines. 5. Plug the Carb Bowl connection port on the charcoal canister. 6. 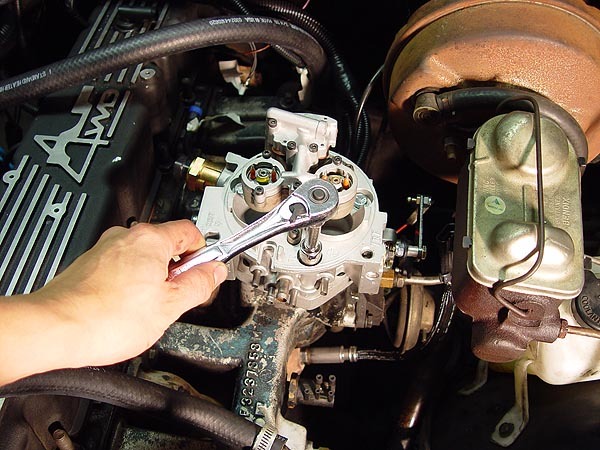 Disconnect the throttle return spring, throttle linkage and fuel line bracket from the engine block as well as the air cleaner bracket and any other upstream/downstream diverter valves, check valves or other emissions equipment. 7. With all the extra crap out of the way, proceed to remove your old Carter BBD using a 7/16" socket or wrench. 8. Take 2 of the old carburetor mounting nuts and attach them (doubled up) onto one of the mounting studs. 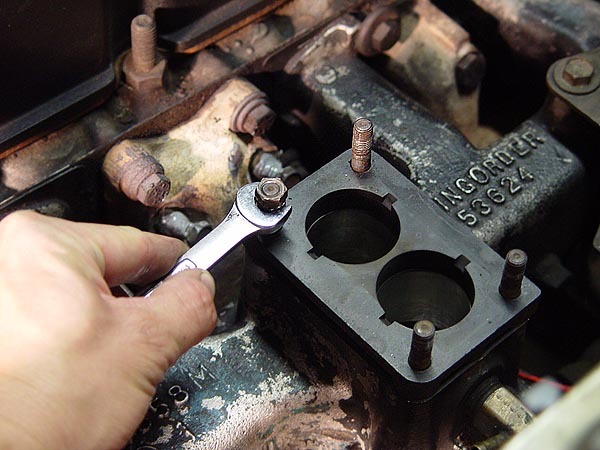 Remove the stud from the intake manifold by turning the lower nut. Proceed to remove the remaining nuts in this fashion. 9. 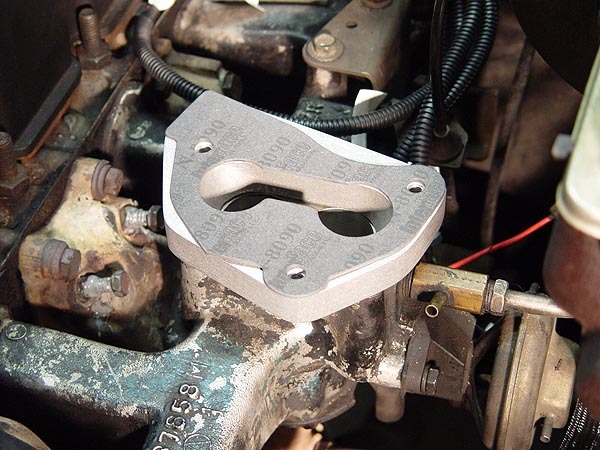 Clean up any gasket material left on the throttle intake using a gasket scraper or razor blade. Be careful not to let any material to fall into the manifold. Once done, cover up the throttle intake with a rag to prevent any other debris from falling into it while working on this project. 10. 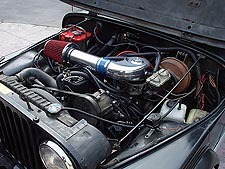 Instead of a Pulse Air System, 1981 CJ's came equipped with an air pump and an air injection manifold (or air tubes). 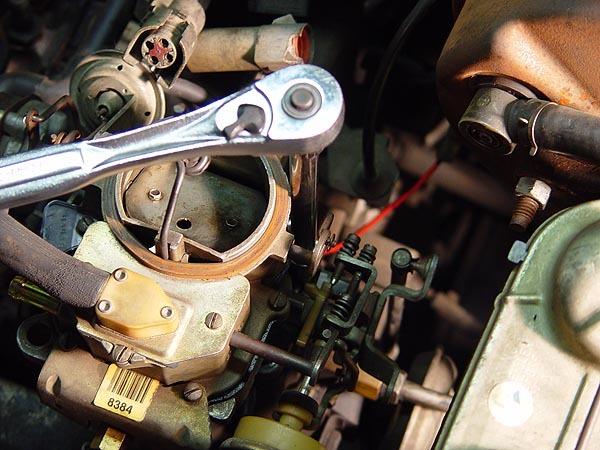 To remove this, you will first need to loosen your serpentine belt and rotate the air pump out of the way in order to access the forward most bolt. Remove the bolts attaching the air tubes to the exhaust manifold. 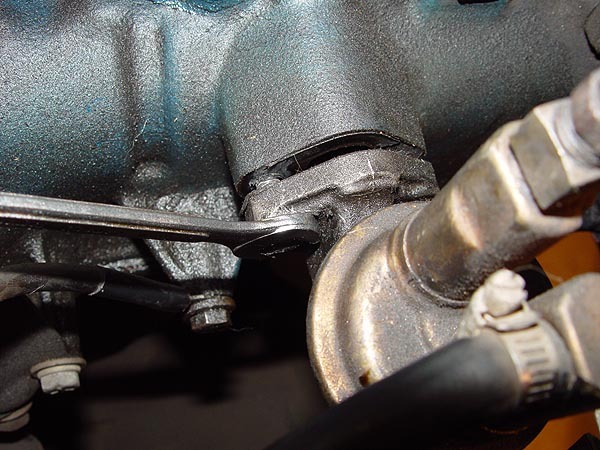 Then, cap off the holes on the exhaust manifold utilizing the old air tube bolts. Make sure the bolt heads go all the way down to the metal or else you will get an exhaust leak. If your Jeep still has an a air tube coming from your catalytic converter, this will need to be cut and sealed off. 11. With all the emissions equipment and carburetor out of the way, go ahead and remove the O2 sensor from your exhaust manifold using a 7/8" wrench. 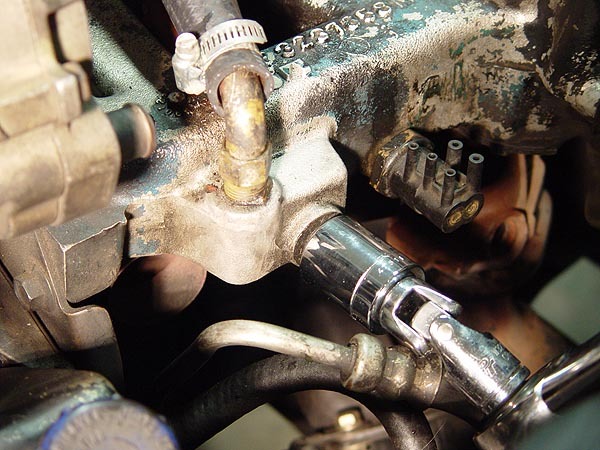 If you do not have an O2 sensor, Howell provides as threaded bung that can be welded onto your exhaust down pipe. The down pipe would need to be removed in order to cut a hole and affix the bung into do this. 12. 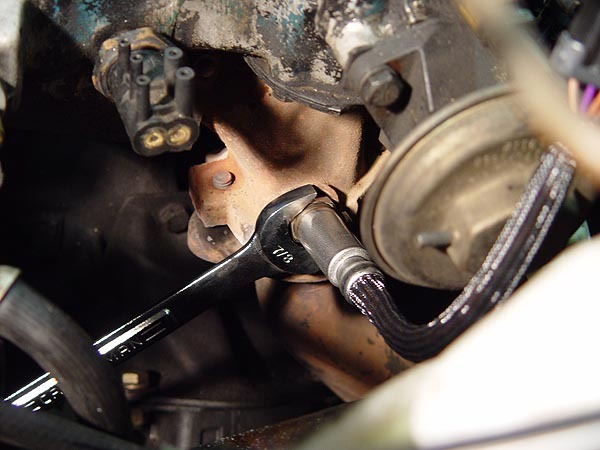 Install the new O2 sensor that come with the Howell TBI kit using a 7/8" wrench. 13. 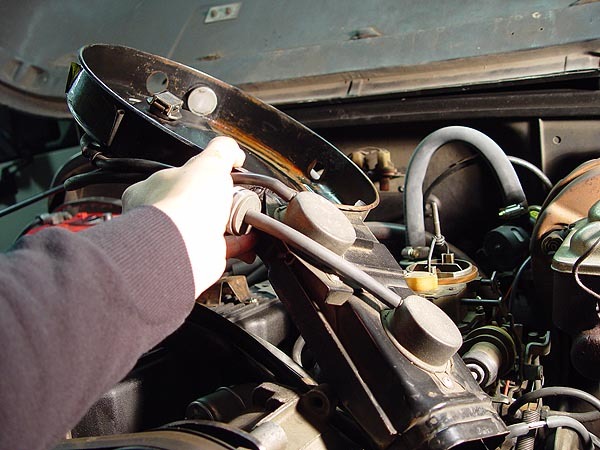 While you are in the area, go ahead and remove the old coolant temperature switch from your intake manifold. I needed to use a 1" socket to do this but I have heard this size can vary. 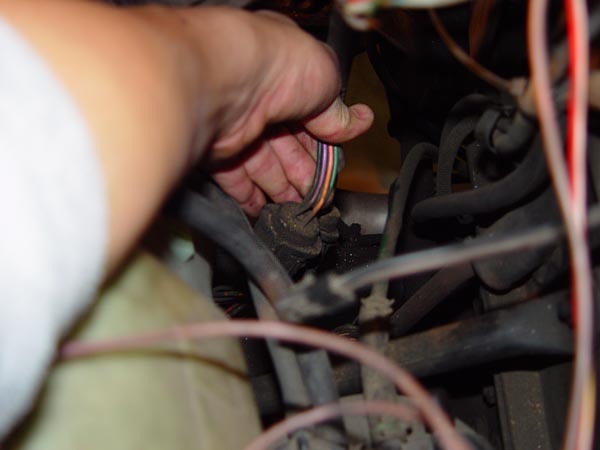 The removal of this switch will cause coolant to flow out so be ready for a small mess. 14. 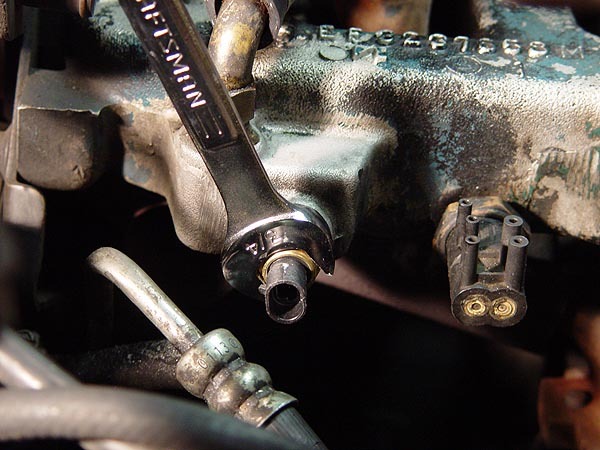 Install the new coolant temperature switch provided with the Howell TBI kit using a 3/4" wrench. The threads on the switch came pre-treated with a sealer but I also went ahead and applied some coolant safe RTV to the outside edge of the switch for good measure. 15. Now it's time to install the Howell TBI unit onto the intake manifold. 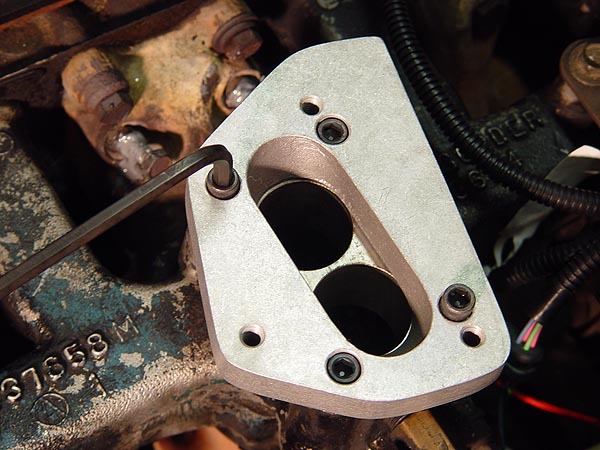 Place the rectangular gasket on top of your throttle intake and then place the Howell TBI adapter plate on top of it. Secure the adapter plate using the four 1/4" allen bolts supplied with the kit in a crisscross pattern to insure a proper seal. 16. Place the larger triangular shaped gasket on top of the adapter plate and align the 3 holes. Make sure all of the allen bolts are covered. 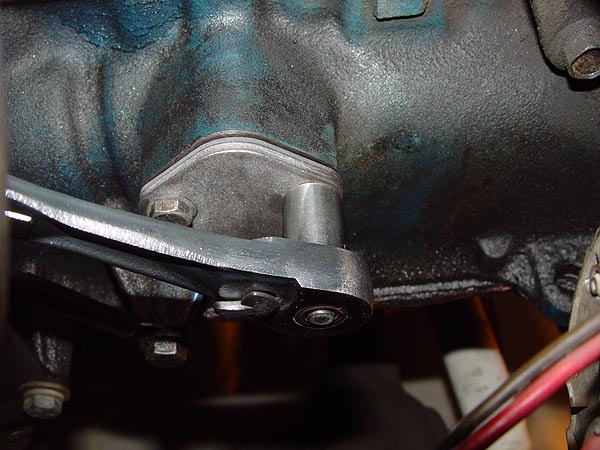 Some older kits came with gaskets that did not fit properly and required you to seal off the allen bolt heads using RTV to prevent any vacuum leaks. 17. If the gasket is a good fit, go ahead and attach the Howell TBI unit onto the adapter plate using the 3 bolts and spoke washers provided with the kit. 18. Unlike later model CJ's that had an ECM behind the glove box, my 1981 Jeep came with the ECM attached to the driver side fender well. Wherever yours is located, go ahead and remove the ECM now along with all the wiring attached directly to it. 19. 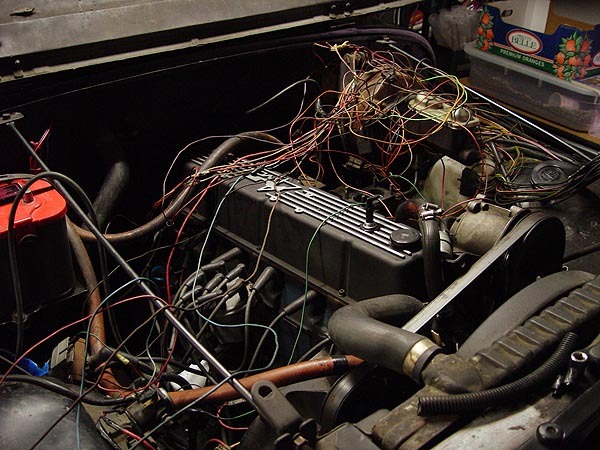 Cut open your wiring harness as well as all the electrical tape and wire ties. Yes, this will look very intimidating in a minute but it's the only way to trace the wires you will need in the following steps to come. The good news is that a majority of these wires will ultimately get chucked. 20. Okay, what we are going to do now is what basically amounts to a Nutter Bypass. 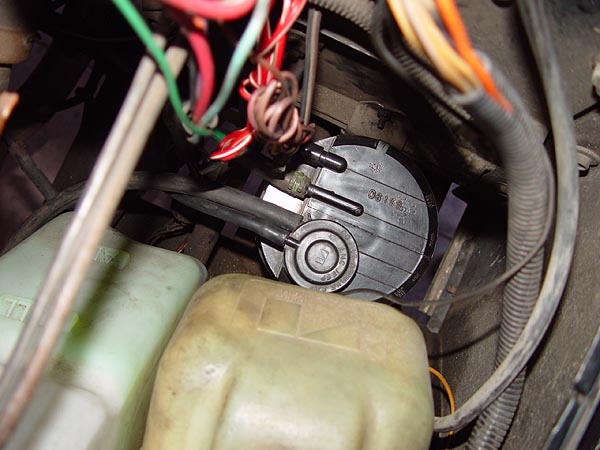 Remove the coolant over flow bottle from the driver side fender well to gain easier access to the Duraspark ignition module. There are 2 plugs attached to this module and the one you want has 4 wires attached to it (black, green, purple and orange). These wires go to a three-wire plug from the old harness. 21. Go take a look over at your distributor and you will find a plug with a purple, orange and black wire attached to it. Take the purple and orange wire and splice it to the purple and orange wire coming from the Duraspark ignition module. The black wires one either end needs to be grounded. See the diagram to the left. 22. 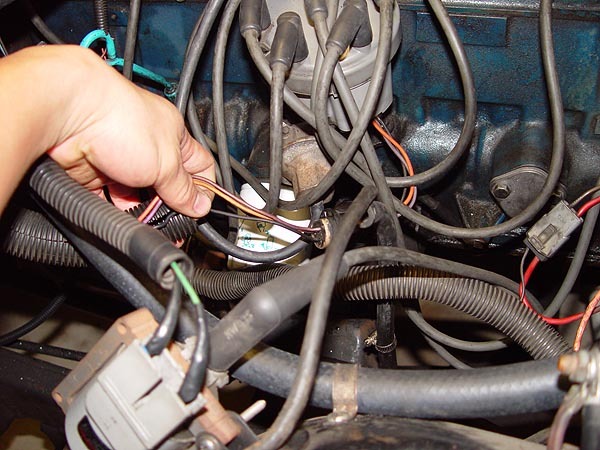 The remaining green wire left on the Duraspark ignition module plug needs to be routed across the engine bay and connected to the coil's negative terminal. See the diagram to the left. 23. These are the only wires you need and the rest can now be discarded. Copyright© WAYALIFE, LLC. - All rights reserved.